The High Sierra Classic PLUS shape is compact and practical. We had experience with a High Sierra prior to installing it in Artemisia. Alex and I had purchased one for our Seattle zero-energy home after the low-flow shower head we had originally installed had given us underwhelming performance. I loved its large water droplets and the feeling of water pressure and flow while knowing that we were saving water and energy. Alex loved how it could quickly rinse the shampoo out of her long, curly hair. Fast forward to building Artemisia, and it was a no-brainer that we would want to test the High Sierra in the demanding vacation rental setting. We believe Artemisia is the first zero-energy nightly vacation rental, and as such, we are exploring new ground. One of the biggest factors in successfully meeting a zero-energy goal is the behavior of the home’s occupants. Do they take military-style two-minute showers? In the case of renters, probably not. We knew that people on vacation like to treat themselves, so the shower couldn’t feel low-flow. We also knew that our home would be host to big groups of up to eight guests, all of whom would want to take long, hot showers après ski. Without high-efficiency shower heads, it would be nearly impossible to meet our zero-energy goal. And unless the showering experience felt luxurious, we knew we would get bad Airbnb reviews. It was kind of a catch-22. The High Sierra we chose included a hose, a hand grip, and a metal holder, all of which felt solid and well made. The High Sierra shower head checks all the boxes: It saves water and the energy used to heat it while still feeling great. Because we don’t have any control over the time our guests spend in the shower, we rely on the High Sierra to keep water usage in check. 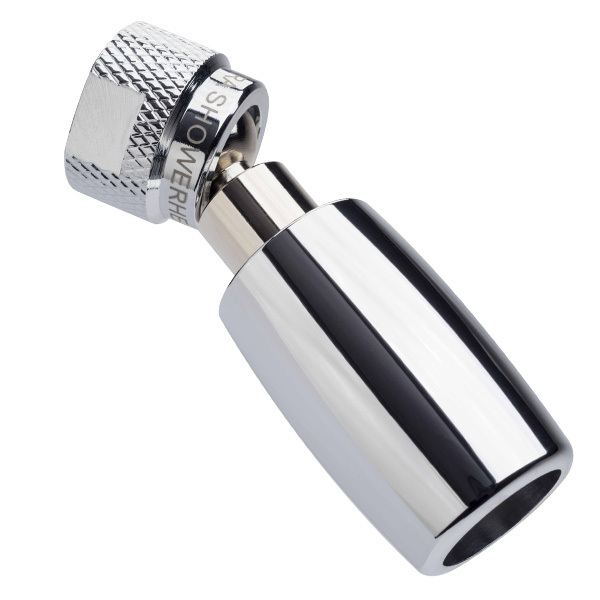 The High Sierra shower head starts at $40 for a simple fixed-head model, but we chose the fancier $125 handheld unit, with all the bells and whistles: slip-free hand grip, metal water hose and holder, and a trickle valve to pause the flow when desired. Since 1992, the United States has mandated that all shower heads sold in the country have a maximum flow rate of 2.5 gallons per minute (GPM). The High Sierra cuts that by 40% to 1.5 GPM, qualifying it for WaterSense certification. The also sell a 1.8 GPM version for homes where the shower is mounted higher on the wall. While we are conscious about saving water at our cabin, Artemisia is on an un-metered community well system, and our most urgent concern is saving the energy used to heat the water. We knew that between guest showers and frequent loads of laundry after each group checks out that hot water heating would be a major component of our limited energy budget. Combining the High Sierra shower head with our heat-pump hot water heater, we were able to drastically cut the energy our home requires to heat water. By our calculations, our home uses only 1,342 kWh per year to heat water versus 3,734 kWh for a home built to code-minimum standards. High Sierra estimates that by replacing just one shower head in your home with their product you will save 600 gallons of water, 94 kWh of electricity, and 98 pounds of carbon dioxide per month. That’s for two people each taking a ten-minute shower per day. If you like to take longer showers or have more people in your household, you would save even more. As I mentioned above, the High Sierra’s spray feels almost indistinguishable from a high-flow shower head, if not a little better. The water droplets are of similar size, which is to say, much larger than those of typical low-flow models. The stream of water has neither that aerated, bubbly feel or that pins-and-needles feel that most lower-quality “eco-friendly” shower heads have. In other words, it feels basically like a 2.5 GPM model, but it saves a gallon of water every minute. If you’re used to an old, super-inefficient shower head that was manufactured before 1992, you’ll notice that the High Sierra is pumping out less water. It lacks that drenching, deluge sensation. It also fills the bathroom with less steam, so can feel just a bit less luxurious than those older water-hogging models. But by most measures, it provides a highly satisfying showering experience. High Sierra shower heads are assembled in Coarsegold, California, near Yosemite National Park. The “Classic” version we installed was mostly metal with a clear ABS plastic cowl. In contrast, typical shower heads are made of crack-prone plastic with a microscopically thin metallic coating. High Sierra now also offers all-metal versions, with several choices of shapes. The unit we tested is compact, heavy, and appears to be extremely durable. 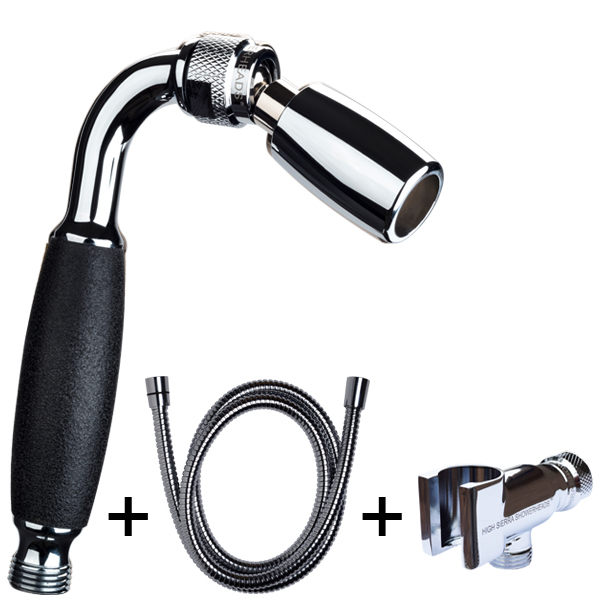 The accessories that came with it, such as the mounting bracket, the handle, the hose, and the trickle valve, all have the same heavy-duty feel to them. The swivel feels solid and doesn’t leak water. One thing that makes the High Sierra last longer than other shower heads is its resistance to clogging. 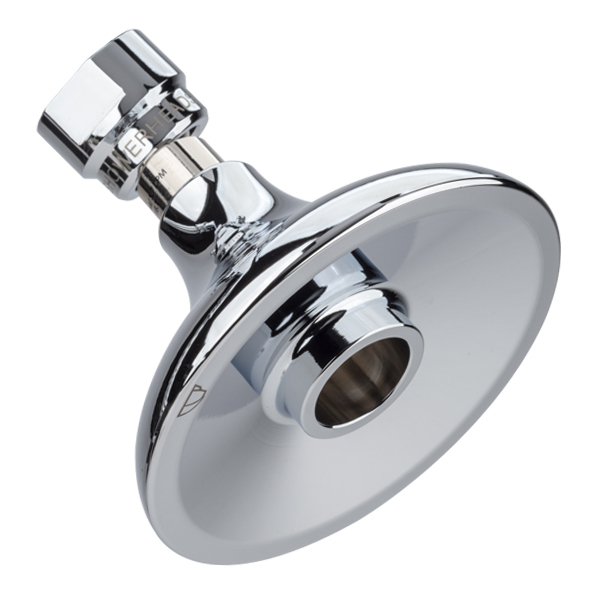 The typical low-flow shower head pushes the water through lots of pinhole-size openings. These are prone to mineral buildup so that the water flows unevenly or not at all. Some manufacturers recommend periodically unclogging their shower heads with vinegar and baking soda. Please! Who has time for that? The High Sierra has just one spray nozzle that is comparatively large in diameter. After spending several years with these shower heads, I’ve never noticed them clogging or slowing down, and I’ve certainly never had to reach for the vinegar. The High Sierra is a high-quality product, but there are a few trade offs. As I mentioned above, the 1.5 GPM flow doesn’t fill the bathroom with as much hot steam as a less-efficient shower head does. This can be a good thing for preventing mildew, but some people may miss the warmth when stepping out of the shower. High Sierra’s new HALF DOME style mimics the more traditional shower head shape. Another element that may be seen as a drawback is the smaller size. I happen to like the compact shape of the High Sierra much more than typical oversize designs. I find the bulky clog-prone plastic units with useless “massage” settings to be especially ugly and annoying, but that’s what most people expect a shower head to look like. High Sierra seems to have solved the “problem” of the compact shape with two design variations that place the compact nozzle in the middle of a saucer-shaped metal cowl. I think I would still choose the Classic, but for those who aren’t comfortable with something that looks different, the other designs would work. Overall, I have been very impressed with this shower head. It costs a bit more than the typical low-flow shower head at Home Depot or Lowes, but it performs noticeably better and should last a lifetime. You can pick one of these up on Amazon, where it’s reviewed very highly, or directly from High Sierra.